Bolinfest Changeblog: Do you remember SAT math? Web Content Wizard is fixed! Do you remember SAT math? A. The quantity in Column A is greater. B. The quantity in Column B is greater. C. The two quantities are equal. D. The relationship cannot be determined from the information given. So that is a quantitative comparison question. Like many upper-middle-class kids from the northeast, I took the SATs for the first time in the 7th grade to try to get into CTY. I didn't know what CTY was at the time, but my mother did, and fortunately for me, she recognized what a tremendous opportunity it would be for me to go. Mom bought me my first copies of 10 SATs and Cracking the SAT that year. (I say "first copies" because I had to buy new ones the following year when they re-centered the scoring and changed the test.) The SAT became my new challenge, and I've been kinda obsessed with the thing ever since. CE and BD are 90° arcs on circles which are concentric at point A. Segment AC is greater than segment AB. The length of arc CE. 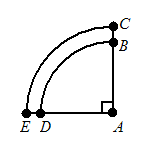 The length of arc BD plus the length of segment DE. The length of arc CE. The length of segment CB plus length of arc BD plus the length of segment DE. I'll write a follow-up post with the answers in a couple of days. I know I found the result surprising (and now I know the best way to walk to work)! Column A: Your math SAT score in 7th grade. Column B: Your math SAT score in 12th grade. Results for me were surprising (well, surprising to me in 12th grade).